This fortnight Patter has given us the word "Motive" for our artwork. When I looked on Bible Gateway ( which is a great place for searching for scriptures) for a verse to use I came across the one I have used , which is Proverbs 16:2. This really spoke to me on top of the devotional thoughts that Patter shared. I realised that something I was getting very involved in was not what God wanted me to be doing. My motives were wrong. I was doing too much thinking of "self" and not putting God first. 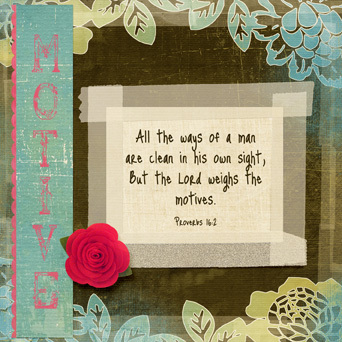 I was becoming too obsessed in my digital scrapbooking - spending too much time on the computer doing things that brought no glory to God whatsoever. Now I have resigned from two Creative Teams I was on for digital scrapbooking and I am experiencing such wonderful peace.